The necropolis of the village of Karmi is thought to date from the Middle Bronze Age (c 1900-1625 BC). 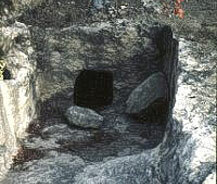 Here a number of rich chamber tombs have been excavated. On the wall of an access passage of a tomb the crude relief of a human figure has survived. This is the earliest relief of a human figure discovered on the island so far. In one of the tombs a Minoan 'Kamares' cup and blue faience beads from Egypt which suggest very early trading relations with Crete and Egypt were discovered. It is called 'the tomb of the seafarer' because it was believed 'that the man probably walked down to the sea at Lapithos and took service with one of the vessels trading between the Syrian ports and the Aegean and that these objects are momentous of his travels'.